The construction operational environment is complex and makes total risk elimination almost impossible. Our Group’s risk management philosophy therefore focuses on the effective and ongoing management of risk. Our rigorous processes include early identification, quantification and assessment of risks and application of risk mitigation measures to reduce the potential impact. We also balance our reward to the value of risk we take to ensure a sustainable business model. Our combined assurance model ensures that key risks are identified and mitigated. The mitigation strategies are all subject to the 3 levels of assurance to ensure the group is adequately protected. The first is a bottom-up approach where risks from our contracts and segments are captured on a database and consolidated through the cluster to group level. Material and/or recurring risks are extracted and prioritized. The second involves senior management identifying key threats to the cluster and group strategy. This is undertaken annually during the groups business planning and strategy process. Risks are reported to the Board through the risk committee and the social and ethics committee. The Board risk committee deals primarily with risk management across the group. The group risk officer presents a risk plan each year to the Board which highlights the key initiatives and ongoing coverage to be achieved. The Board risk committee approves the plan, together with any policies and procedures governing risk management in the group. 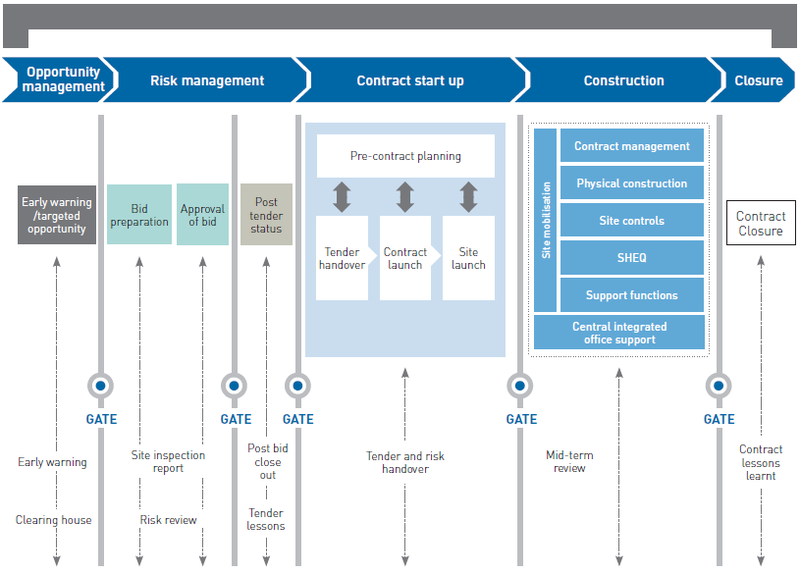 The contract risk lifecycle depicts the risk process within the group for all contracts, from the identification of potential contracts to the contract closure. All potential opportunities are identified by the respective segments and approved to proceed by the relevant segment director or cluster director, based on the value and location of the potential contract. Once the segment has obtained further information, the contract is presented to a clearing house committee for approval. Members include the group’s executive committee (exco) members and other relevant senior management. The clearing house committee approves or declines the opportunity presented based on the risk profile of the contract and strategic fit. At the end of each of our contracts, a formal close-out meeting is convened where the lessons learnt during implementation are updated and approved by the relevant contracts director. This process is currently undertaken manually. However with this soon to be implemented group’s new risk management system, the lessons learnt will be captured and uploaded electronically onto a central database. The database will be accessible to all employees within the group and will be used to ensure continuous learning and improvement of our processes/policies.